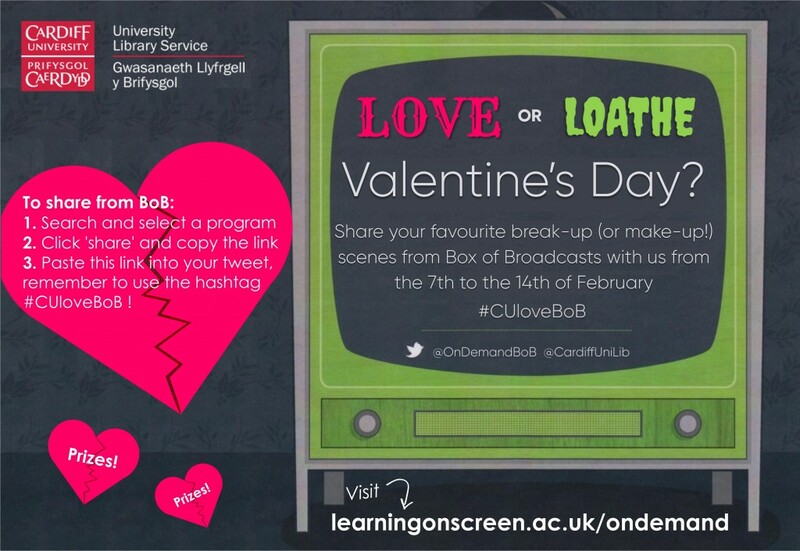 From 7th – 14th February Cardiff University Libraries are showcasing the ‘Box of Broadcasts’ (…that’s “BoB” to you and me), the on demand TV and radio service for education to which all Cardiff University students and staff have access. The Box of Broadcasts can be accessed at learningonscreen.ac.uk/ondemand, just select Cardiff University from the list of institutions and sign in using your CU username and password. Your libraries will be tweeting throughout the week to give you inspiration and to showcase the wealth of archives available on BoB. Follow us @cardiffunilib. Winners will be selected after the 14th, there are Valentine’s chocolates to be won!